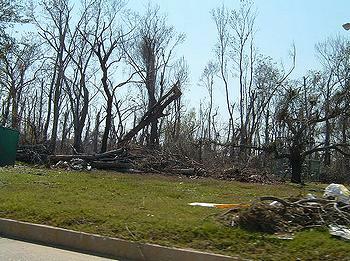 Researchers had expected to find a loss of trees in New Orleans after the devastation of Hurricane Katrina in 2005. “Our urban forests are under stress, and it will take all of us working together to improve the health of these crucial green spaces,” said U.S. Forest Service Chief Tom Tidwell. Urban trees provide benefits three times greater than tree care costs, as much as $2,500 in environmental services such as reduced heating and cooling costs during a tree’s lifetime. For the study, forest researchers David Nowak and Eric Greenfield of the Forest Service’s Northern Research Station used satellite imagery to find that tree cover is decreasing at a rate of about 0.27 percent of land area per year in U.S. cities. This is equivalent to about 0.9 percent of existing urban tree cover being lost annually. Nowak and Greenfield completed two analyses, one for 20 selected cities and another for national urban areas, by evaluating differences between the most recent digital aerial photographs possible and imagery dating as close as possible to five years prior to that date. The paired aerial photographs were interpreted to assess recent changes in tree, impervious and other cover types in 20 U.S. cities as well as urban land within lower 48 states. Photo-interpretation of paired digital images offers a relatively easy, quick and low-cost means to statistically assess changes among various cover types, said the researchers. Tree cover in 17 of the 20 cities analyzed in the study declined, while 16 cities saw increases in “impervious cover,” that does not allow rain and snow to reach the ground, including pavement and rooftops. Tree cover ranged from a high of 53.9 percent in Atlanta to a low of 9.6 percent in Denver while total impervious cover varied from 61.1 percent in New York City to 17.7 percent in Nashville. Cities with the greatest annual increase in impervious cover were Los Angeles, Houston and Albuquerque. Only one city, Syracuse, New York, exhibited an overall increase in tree cover. However, the increase was dominated by European buckthorn, Rhamnus cathartica, an invasive small tree / shrub from Europe, and the most of the city’s cover increase is likely due to natural regeneration. To help in quantifying the cover types within an area, a free software tool, i-Tree Canopy, allows users to photo-interpret a city using Google images. Since the initial release of the i-Tree Tools in August 2006, numerous communities, nonprofit organizations, consultants, volunteers and students have used i-Tree to report on individual trees, parcels, neighborhoods, cities, and entire states. Cities included in the study were: Albuquerque, Atlanta, Baltimore, Boston, Chicago, Denver, Detroit, Houston, Kansas City, Los Angeles, Miami, Minneapolis, Nashville, New Orleans, New York City, Pittsburgh, Portland in Oregon, Spokane, Syracuse, and Tacoma.